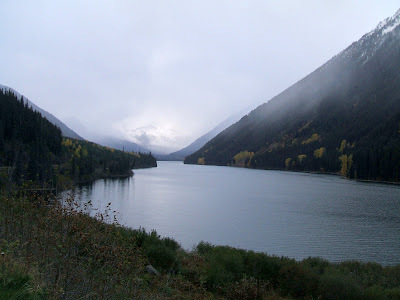 Our drive was on a day that clouds had moved in after the sun had been shining earlier but as we left Seton Lake to drive to Duffey Lake, we saw this magnificent view of the first snowfall of the season up on the mountain tops ahead. One needs to drive with care due to some rough spots on this stretch of road, especially if youre driving the RV but with the proposed road improvements coming, this route will be even better for the RV travellers as well as everyone else. It won’t change the camping facilities but will make the drive much easier. The views are so beautiful that you’ll want it to be a slow drive to get the full benefits. 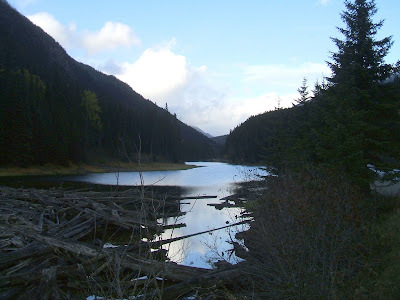 Duffey Lake in the Cayoosh Creek Valley sits beside Hwy. 99 and is about 50 km (30 mi) from Lillooet, BC. This route was used historically for First Nations to travel into other parts of the province. 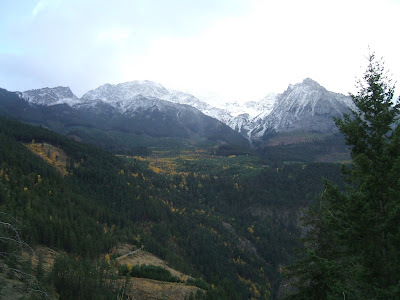 Our visit this day followed the first overnite snowfall of the season on the mountain tops. Although we had no snow at our level, we had very low cloud coverage at times so that prevented us from seeing most of the mountain views, but what views we did have were great. The sun was shining on the snow-capped mountains at the far end of the lake and made it look like a special effect on this already beautiful scene. Duffey Lake Provincial Park is centered around Duffey Lake. It covers 2007 Hectares, (4,960 A.) and offers many opportunities to hike, climb, rockhound and just enjoy the pristine views. Duffey Lake Campground, alongside Hwy 99 has facilities limited to picnic tables, but offers the opportunity to canoe, kayak or fish for the rainbow trout stocked in the lake. 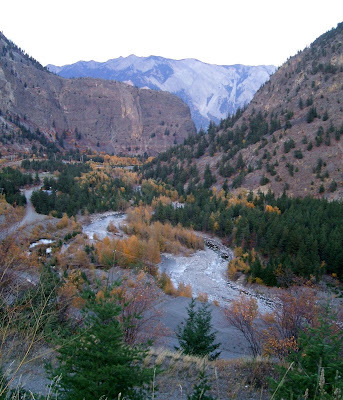 As we made our way back to Lillooet at the end of the day, the view of Cayoosh Creek in the valley below us shows the beautiful fall colors. With the high mountains surrounding every turn, it was too late in the day to get the benefit of the sunshine down there but the view was reminding us of the shorter fall days and the season changes coming. Cayoosh Creek from Seton Lake to Lillooet, B.C.